The CMPCT folder is the ideal bike to use in busy towns and heavy traffic conditions. With its relatively high seating position and special frame geometry, the CMPCT allows a good general view of the traffic, excellent maneuverability, and an unmatched comfortable riding position. The rear suspension in combination with the wheelbase makes the CMPCT an easy going bike with astonishing qualities and balance. 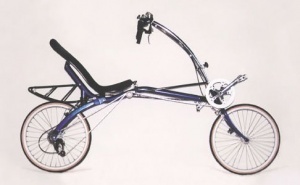 The CMPCT folder offers all the benefits of recumbent riding with the convenience of being able to fold to a compact package of just 80x80x35 cm. Wheels standard wheels 16 inch (305) front, 20 inch (406) rear, option: 2 x 20 inch (451) aero wheels.